Asbestos Air Monitoring in New York, NY | ProActive Environmental Corp.
Asbestos Air Monitoring is when asbestos fibers are released into the air and cause health issues to humans or damage to the structure of a building. These hazardous fibers are best monitored when the structure of a building has been compromised such as renovating or adding an additional space. The reason why asbestos air monitoring is conducted is so that the industrial hygienist can better assess the exposure and risk of the fibers within a closed area. 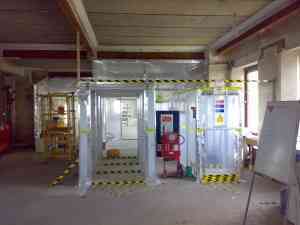 When will you need Asbestos Air Monitoring? Airborne asbestos fibers are generated by the disintegration of asbestos containing materials. If an industrial building was built back when workers used asbestos containing materials, and you are currently performing a renovation, then you will need to find a qualified industrial hygienist to perform the appropriate asbestos air monitoring test. You shouldn't wait until after renovations to check for asbestos, call a professional today for asbestos sampling and indoor air quality assessments. Jeff Bodell of ProActive Environmental Corp. has over 15 years of experience in Occupational Health & Safety in commercial and industrial facilities. He has worked with high-profile New York City clients such as Hilton Hotels, Roosevelt Hotel and the New York Helmsley Hotel. Jeff can be reached anytime at 917-620-5546 or via email at jeff@proactiveny.com. Please contact ProActive Environmental Corp. for more information on Asbestos Management and Indoor Air Quality assessments.